DENVER — Imagine driving through a city like Lakewood and never hitting a red light again. The idea isn’t as far off as it sounds. Automakers like Audi are partnering with cities Lakewood to collect data from traffic lights to integrate into their technology. For about three years, Audi has offered a Time-to-Green feature in its newer-model cars. “It gathers real-time signal data, and then it uses a process to predict when a signal turns green,” said senior strategist of Audi Connected Data Balaji Yelchuru. Yelchuru believes that the technology can increase the safety and overall driving experience for Audi owners. Last month though, Audi took the technology one step further, when it rolled out the Green Light Optimized Speed Advisory System (GLOSA). The technology shows drivers how fast they need to go to make the upcoming green light. However, the recommended speed caps out at the speed limit so that it won’t encourage drivers to speed. All of that information is displayed on the control panel of the car’s dashboard, so drivers don’t have to take their hands off the steering wheel. Yelchuru is also the leader of the GLOSA project, which has already rolled out in Lakewood since the city already has a traffic light signal control system. “We have about 100 signals connected in Lakewood,” Yelchuru said. Audi uses the data the city is collecting to process the traffic signals’ timing and send that information to drivers. With this type of technology, Yelchuru believes cities could cut down on congestion. “If everybody reacts to the signal right when it turns green you could get a good improvement in the efficiency because everybody can move at the right time,” he said. Audi is now working with Aurora, Thornton and the Colorado Department of Transportation to roll out this technology later this year. However, this is only the start. Right now, there is only one-way communication from the traffic signals to the cars. Yelchuru says the automaker is working toward a system that allows the cars to communicate back to the traffic signals so that the vehicle can indicate when it’s approaching an intersection. “We see this is a foundation for the future for smart mobility,” he said. The technology doesn’t come cheap; after an initial trial period, Audi drivers will need a newer model car and will have to pay about $200 every six months or about $500 for 18 months for the Audi Connect Prime service. Other companies are working on a more affordable way for drivers to tap into this emerging technology. His company has developed a free app for drivers to download onto their phones that have similar capabilities. Ginsberg knows that people can be impatient and believes the app can relieve some of that driving anxiety. “Waiting at a 60 second light it feels like it’s going to be forever like you’re going to die of starvation before the light changes,” he said. The Enlighten app will tell drivers how long a red light is expected to last, which can turn into practical knowledge for drivers. Several seconds before the light will turn green again, a bell will sound on the phone to let drivers know to focus their attention back on the road. Beyond that, the app displays an arc that resembles a speedometer with an arrow. If the driver keeps the needle within the green portion of the arc, they are going to make the green light ahead. Enlighten not only predicts the light directly ahead of a driver, but it also predicts the one beyond that, “Because a lot of places if you manage to hit two lights green, you’re going to have them all green,” Ginsberg said. The app also takes things into consideration like preemption. That’s when traffic lights have technology to change to red to allow for emergency vehicles or buses to pass through. When that happens, the app stops predicting green lights for a time to allow things to get back to normal without passing bad data on to drivers. “When that happens, we stop making predictions at that light for about two cycles because we know the light is sort of trying to re-organize itself and get back into sync with all of the neighboring lights,” Ginsberg said. Right now, automakers are the primary customers for Connected Signals, which collects data from more than 17,000 intersections worldwide. The group is hoping to roll out the technology nationwide by the end of the year by crowdsourcing the data. However, it is facing pushback from some cities. For Ginsberg, the green light technology has the potential to change traffic and driving habits in a tangible way. Along with easing anxiety for drivers, supporters believe the technology can make for safer driving habits. A 2016 study of the technology, BMW and others showed that there were fewer instances of rapid acceleration and braking among drivers. The approach speed for drivers when coming to an intersection was also lower since there was less guesswork by drivers about whether or not they would make a light. Moreover, the study showed that the amount of time drivers spent at red lights went down significantly. Along with helping drivers make green lights, this type of technology also has the potential to cut down on carbon emissions. If this type of technology can usher cars through more green lights and cut down on the amount of time cars spend idling at a red light, it could help combat climate change. “If every car on the planet knew what every traffic light on the planet was doing, human carbon production would fall by 1.3 percent. It’s an enormous number. It’s almost 500,000,000 tons of carbon a year,” Ginsberg said. For Audi, the goal is to eventually use the Time-to-Green programs to turn off the cars while they are idling using the Start/Stop technology in them and then turn the car back on right before the light turns green. So, if a light is red for three minutes, the vehicle can go into the stop mode for two minutes or more and then switch back to idle for the last minute. Mayott-Guerrero says this technology isn’t going to solve the issue of climate change overnight, but it does have the potential to make a difference. “Any, even marginal decreases, will be so critical,” she said. Any time a new technology is introduced, there’s a potential for abuse. Both Audi and Connected Signals have taken steps to try to prevent drivers from using their apps for illegal activity. For Audi, not only does the program try to dissuade drivers from speeding to make a red light, but it also tries to prevent drivers from slamming on the gas right as a light turns green. “For example, the Time-to-Green we, by design, take it away from the display a few seconds before the signal actually turns green. So, in a sense, we are not giving it as a counter where we can start counting three, two, one kind of a situation,” Yelchuru said. That change also encourages drivers to look up from their dashboard for the final few seconds before a light turns green to rely on the signal itself instead of the car’s system. The Enlighten app does the same thing to try to prevent drag racing for instance. 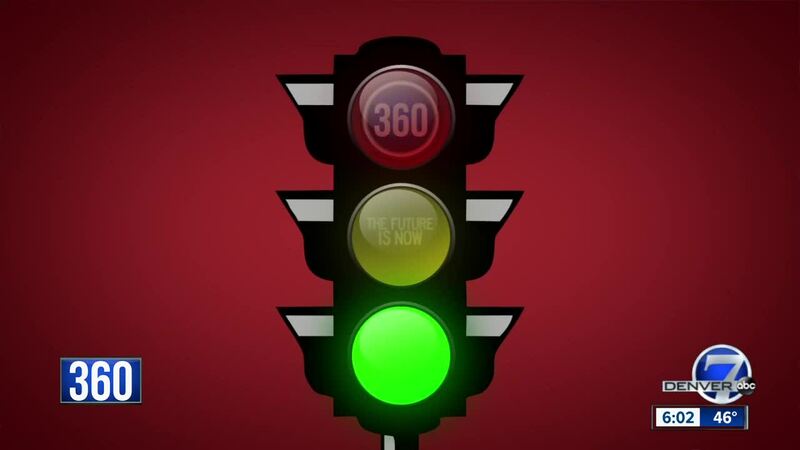 Traffic light technology is constantly changing. The latest integrations are just another way to pass along some of that information to drivers. Whether the technology actually makes a difference in driving habits or cuts down on accidents at intersections has yet to be determined. However, more cities around Colorado and across the country are exploring the possibilities.